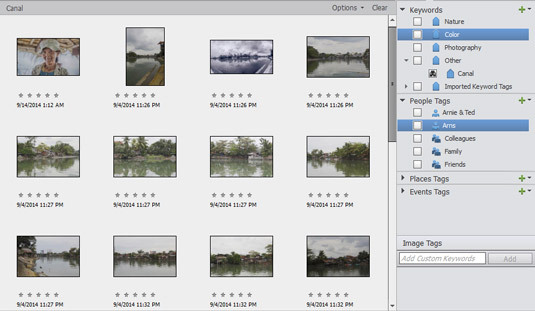 Tags are a great way to organize your files in Photoshop Elements. After you acquire your images in the Organizer, you can tag images according to the dates when you took the pictures, the subject matter, or some other categorical arrangement, so that the images are easy to sort. 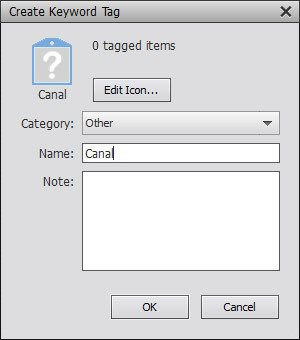 The Organizer’s Tags panel helps you tag your photos and gives you the flexibility to customize your tags. The Tags panel is divided into four categories: Keywords, People Tags, Places Tags, and Events Tags. The Tags panel in the Organizer. The Organizer helps you organize your photos into these four main categories, and each category has a drop-down list you can use to create new tags and add new subcategories. The Create Keyword Tag dialog box. Depending on what category you choose, the information you fill into the dialog box varies. For example, when you add a new tag in the Keywords category, the Create Keyword Tag dialog box provides options for editing the tag icon, specifying a category, typing a name, and adding comments. If you add a People tag, you type a person’s name and choose a group such as family, friends, and so on. If you add a Places tag, you can choose to map the location. If you add an Event tag, you type the tags for the event, choose dates, and add a description. Hence, the attributes change according to the type of tag you create. Click a photo and Shift-click another photo to select photos in a group. Click a photo and Ctrl-click (⌘-click) different photos scattered around the Organizer to select nonsequential photos. The Tags panel after adding a tag in the Keywords category. The checkbox adjacent to the tag name is used to display all photos with the respective tag in the Media Browser. The more you become familiar with tagging photos, the more opportunities you have for sorting and finding photos and adding found photos to albums. Play with the Tags panel and explore creating tags and tagging photos in each of the different categories. Tagging photos is useless unless you have a way to view the photos according to their tags. The Organizer makes it easy to view your tagged photos. Simply click the check box next to a tag name (the check box occupies a tiny pair of binoculars when checked). The Media Browser view changes to show you all the photos that have been tagged with the respective tag name. If it takes a few moments to display the images, just wait and Elements will catch up. The Media Browser displays photos that have been tagged with the item you check in the Tags panel.